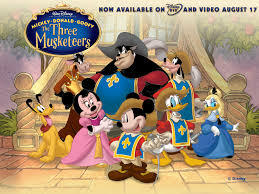 Brief Synopsis – Mickey, Donald and Goofy dream of becoming Musketeers and defending France and the royal family. My Take on it – I was excited to watch the famous Disney trio of Mickey, Donald and Goofy act in a story about Dumas’ famous defenders of the French crown. Unfortunately, since there are only 3 and not 4 famous characters, the writers could never figure out how to do the story properly, so they decided to create a brand new story which is much weaker than could have been hoped for. It was fun to watch, but the story felt too plain and generic. Bottom Line – Fun to watch the trio together in a full length film but the story is weak and felt very generic. you are right- some excellent animation here, some great scenes but messy scripting. Compare this with the beanstalk piece in “Fun and fancy free”. such a contrast. In terms of “modern Mickey” films, I am afraid the “Christmas carol” is a bit of a mess too, but the “Brain” film is astonishing! Thanks for stopping by and commenting Tim!